Vantage Point Strategies is a lobbying and government relations consulting firm in Washington, DC whose mission is to develop and implement customized legislative strategies that help our clients meet their federal government relations goals. We advise large, mid-cap and innovative startups looking to shape policy and federal budgets and access defense, homeland security, cybersecurity, and energy federal markets. While we have considerable expertise and depth in these particular areas, we have the agility and contacts to assist clients across a wide range of issues. 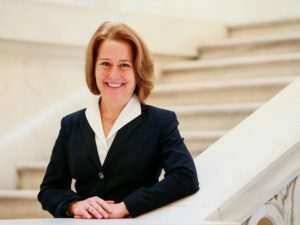 Judy Hafner has a unique combination of government relations consulting and business management consulting experience. Judy not only understands the culture and details of federal legislative and regulatory processes, but also recognizes and appreciates the pressures companies are facing in making strategic decisions to grow, innovate, increase revenue, and decrease costs. She understands that it is vital for a company to have a government relations strategy that is linked to and executed in conjunction with its overall mission and strategy. She can offer clients the foresight they need to analyze and adjust their strategies appropriately. Judy is an experienced government and political affairs professional with a proven 20+ year history of creating and implementing successful public policy strategies, providing superior legislative advocacy, and delivering effective tactical communications to target audiences. As a Vice President at Denny Miller Associates (DMA) for 12 years, Judy represented and delivered results for public and private sector clients from the defense, homeland security, cybersecurity, high performance computing, and energy industries. She worked with the Legislative and Executive Branches to pursue policy, budget, appropriations, and regulatory modifications. In addition to her lobbying experience at DMA, Judy also served as the Director of Federal Affairs for the American Association of Airport Executives managing the association’s legislative advocacy programs. Her career in federal level politics began as a Research Assistant on the US House of Representatives Public Works and Transportation Committee; and then as a politically appointed Congressional Liaison Officer for the US Department of Transportation. In addition to her government relations consulting work, Judy has several years of business management consulting experience. She was a Senior Consultant with Andersen Business Consulting; a marketing and strategy consultant with the MBA Enterprise Corps in Bulgaria; and a corporate development consultant with Irwin Financial Corporation. Judy has an MBA from the Darden Business School at the University of Virginia and a BS in Finance from Boston College. Judy has a broad bipartisan and trustworthy network of contacts developed throughout her years of experience in the US Congress, Executive Branch, private sector consulting, and government relations consulting. She draws on these resources to provide her clients with superior legislative advocacy. Judy has excellent working relationships with Members of Congress, many of the staff that support these members, and professional staff of the various congressional committees from both sides of the Capitol and both sides of the political aisle. She also has close contacts in the Executive Branch at several key agencies. Through regular communication with her contacts, Judy is able to provide her clients with timely information regarding policies and opportunities that may impact their business operations and strategy. Judy’s passion and drive for excellence has provided her clients with high value public policy outcomes.